Updated April 24, 2018. See document history at end for details. On Wednesday, December 9, 2009, Norwegians witnessed a marvel in the morning sky. Officially, some were calling it a failed Russian missile test, which Russia denies. Others speculations range from a UFO, a new astronomical discovery, to even a black hole. Until I inquired furthur, it only appeared an oddity when saw it briefly on the evening news. 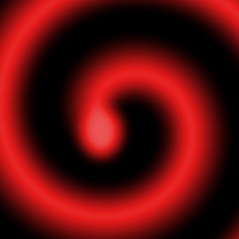 The marvel began as tight spinning spiral which faded as it came close enough to appear as a dark sphere with white border. A blue energy plume emerged from its axis of rotation, seemingly bent away from the sun by the solar wind in the manner of a comet's tail, during the entire two minutes it was seen. To anyone familiar with astrophysics, this phenomenon had all the appearance expected of an astronomical singularity of some type. 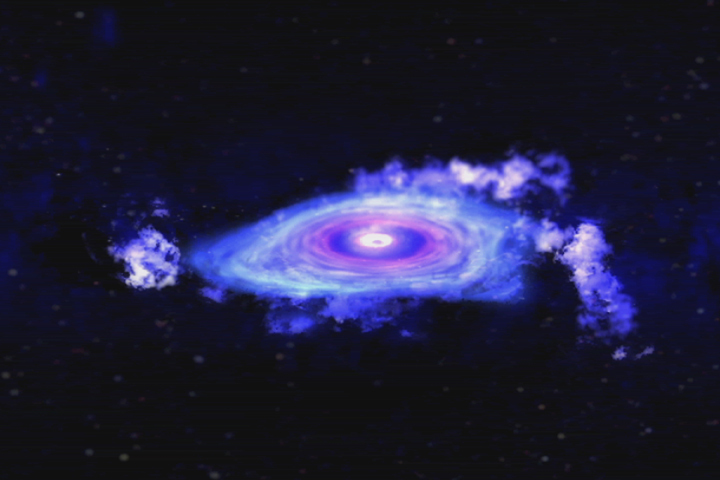 The accretion disk and the on-axis energy plume are readily familiar. 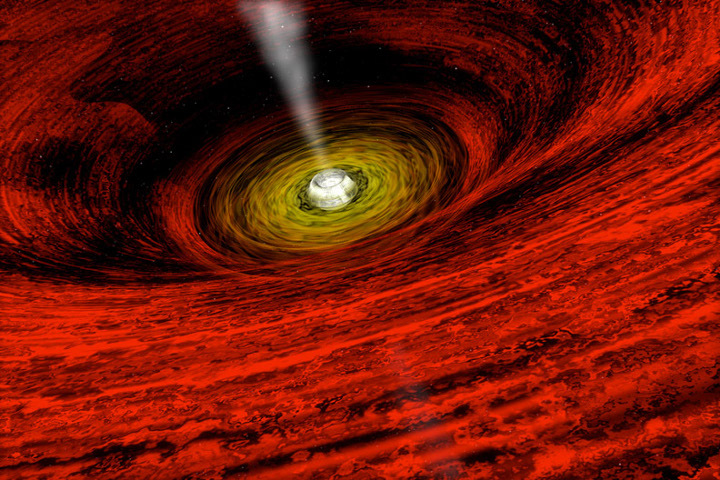 If this is not a hoax, a near encounter with a stray neutron star, black hole or other singularity represents the scariest astronomical encounter we have ever had. The comets that struck Jupiter in 1994 pale in comparison for the moment. The expectation that such objects are estimated to be much heavier than the sun may mean that the object could have been much farther away than the apparent size of its event horizon would lead us to believe. If no damage is done, it may be the most exciting event that physicists have ever had an opportunity to witness. It was a grand opportunity to witness something we usually only think of as being very far away. I would not be too hasty to take this as an omen. You should consider that if it can happen at all, it has always been possible. Interpretation of prophecy still has to closely follow the Bible. Besides, in this day of easy deception, it may be better to reserve judgment until more can be discovered. Particulary suspect is the limited geographical area from which such a huge phenomenon was viewed. Perhaps too, an event of this apparent magnitude might become a matter of secrecy for fear of public panic. Let's watch and see how the spin comes out. On furthur thought, I need to add some ideas. First, the energy plume could also have been drawn out of our sun by the object's intense gravity rather than being emitted by it. Second, this could be a routine event. Such heavy objects are often the center of astronomical systems. Our encounter could have been the near passby of an extremely eccentric orbit, our solar system being a part of the singularity's larger system. In this case, the orbit may last thousands of years, our last encounter possibly expaining as yet unexplained ancient or prehistoric events. Consider Matthew 24:37, But as the days of Noah were, so shall also the coming of the Son of man be. (Remember also, No man knows the day or the hour.) Such a long orbit would cause considerable unpredictability, each near orbit encounter perhaps having a different outcome. Your primary objections to this wonder may be explained. The perfect geometric appearance of the inner accretion disk as the object got closer gave some pause to think the images to be a digital creation. Instead, they may be an unexpected but plausable result of the fierce graviational field produced by the object. All matter in this part of the disk would be forced into alignment with the lines of gravitational force. The illustrations below do not anticipate this effect, however. Why didn't we feel its gravitational pull? It is like a free fall under earth's gravity. Where the bodies involved are allowed to respond freely to their mutual gravity, there is no perception of the force involved. In this case, the singularity's gravity would pull our solar system into an arc where the centripetal force created by the intense gravitational field would be exacty matched by the centrifugal force of the arc of movement. As long as the distance to any significant gravitational effect was large enough to act on our solar system as whole, our solar system could hurtle anyway whatsoever through the universe and we would never know! However, the same laws of celestial mechanics that created a free fall effect that prevented us as individuals from feeling the singularity's pull also have another affect. The closer side of objects to the singularity would be induced to travel faster than the further side, producing forces that attempt to bend a sphere to an egg shape. The effect of these stresses on the Earth would be easy to imagine but difficult to predict. Mindbending! And perhaps still a mystery. 1. Planisphere. This is a round star chart with a window revealing the horizon and night sky. Matching the date and the time on a sliding scale on the edge sets the view for a particular time of the night. 2. Compass. You must have a compass to interpret the planisphere. 4. or a planetarium program. (Kstars under Linux works well. You can download Stellarium and others for Windows from www.download.com). 5. Red pen light to examine charts. Red light does not interfere with night vision adaptation. 6. Binoculars. Most people rarely use telescopes they buy. A good pair of binoculars will find many uses. For astronomy (or other night viewing) the exit pupil specification needs to match a dilated pupil size of 7mm. exit pupil = objective aperature / magnification. This calculates to binoculars designated 6x42, 7x50, 8x56, 9x63, etc. Larger aperatures (the second number) are desired for brighter images. Diagram illustrating the type of long elliptical orbit by which our solar system might revolve around a large singularity. NASA SOHO videos show a ring-shaped object come around the sun. If this is the Norway spiral, they saw signs of it five days in advance of its appearance to earth. Claims of human origin would lose credibility as well. Click thumbnail or link below to look for yourself. To see the data for yourself, click the following link then data/archive followed by mpegs. On January 13, 2010, an asteroid passed by earth at a distance of about 80,000 miles. This 30-50 foot rock passed about 1/3 the distance to the moon. Other information that I could find stated that impacts were expected to produce craters 15 times the diameter of the projectile. This is in the range of the 600 foot craters that the first A-bombs made. Astronomical impacts contain energy disproportional to their size because of their enormous velocity relative to the earth. Consider that energy increases with the square of the velocity in the kinetic energy equation e = ½mv2. The superpowers likely hold hands whenever there is a possibility of unexpected meteor showers because inbound ICBMs resemble meteors in appearance. Add an A-bomb-like explosion also. (Although, without the same brilliant flash of light.) You could imagine how raw nerves would be. One event is far from statistical significance. Still, it would be well if you prayed that nuclear powers would keep their heads in the face of such phenomonen. I am skeptical of the report at the beginning of March 2010, that the earthquake in Chile shifted the Earth's axis by about 3 inches and shortened the day by 1.26 milliseconds. This shortening of the day implies that kinetic energy was added to the Earth's spin. My concept of Newton's third law of motion is that any force acting only within the Earth's immediate sphere of influence would have an opposite and cancelling effect. Except the Earth's core and crust rotate at different rates and these were altered with no net energy change, only an event that ejected significant matter from the earth at some good escape velocity could have any hope of having such an effect. I would more likely believe that the brief passing of a singularity, being an external effect, could cause these things than the explanation that was given. On November 8, 2011, at 6:28pm EST an asteroid passed by earth at a distance of 201,700 miles. At 400 meters (or 1300 feet or a quarter of a mile), it was as long as an aircraft carrier. Passing at 29,000 miles/hour it had massive kinetic energy. Out of curiosity, lets calculate an approximation of the kinetic energy of this projectile from its velocity relative to the earth. To calculate the kinetic energy of the object the velocity must be converted to the metric MKS (meter-kilogram-second) units. This incomprehensible amount of energy pales the largest hydrogen bomb test ever done, the 50MTon Tsar Bomb tested by the Soviets in October 1961. You can view that explosion on the internet to get some sort of perspective. As of March 11, 2013, this monster still seems to be throwing rocks. Astonishing news came on February 15, 2013 that a meteor of several kilotons energy exploded near the Chelyabinsk region of west Russia. Over a thousand were injured by shrapnel created by the shock wave and the Russians later revised their estimate of the force of the blast to about 200kTon. 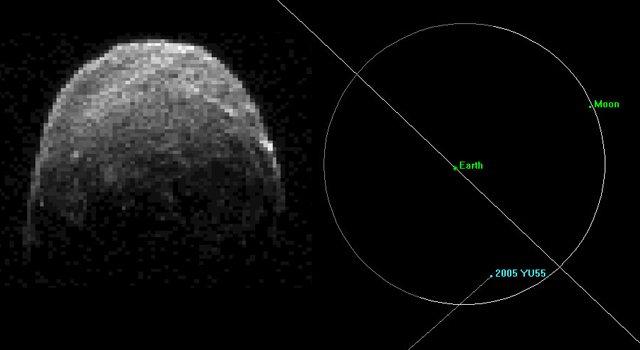 This occurred entirely by surprise as the world watched the larger 2012/DA14 asteroid fly by. While still in amazement at this occurrance, news today is that four asteriods passed nearby in the past week. The largest, designated 2013 ET, was estimated to be 460 feet long. Without advanced notice - on April 15, 2018 - a dangerous asteroid passed the earrh about half the distance to the moon. Named Asteroid 2018 GE3, the 48 to 110 meter object whizzed by at 2:41 a.m. EDT at a distance of 119,400 miles. If an average size of 80 meters was calculated against its flyby speed of 26.5km/s (66,000 mph) I estimate it would have had 1.1GTon of explosive energy if had impacted. This is consistent with reports comparing it to the one that devastated the Tunguska region in Siberia on June 30, 1908. Artistic recreation of Discovery Science Channel video. April 20, 2010. The representation of the spin of the inner accretion disk of a black hole on an astronomy show on the Discovery Science Channel3 surprised me. Aside from being a different color, it looked exactly like some videos of the Norwegian Spiral that were published. I have not heard any confirmation in the media of a scientific belief that this event was a singularity, although I may not have heard all that you have on this matter. The resemblance of the two videos implies that astronomers may believe the event is a singularity after all. If the scientific video predates the Norwegian Spiral, the official story was disingenuous. If it came after, they may have based their image on an observation of which they were not allowed to speak. Science is expensive. Be sure you know that, like so many other things, it has to serve the benefactors who fund it. June 27, 2011. After a report in the evening news of a recent near asteroid miss, the Discovery Science Channel dropped another clue. Our solar system not only revolves around the Milky Way in an ordinary orbit but has an up and down motion as well they said.4 It immediately occurred to me that this "up and down motion" is a clear indication of an elongated elliptical orbit around an object much more massive than our sun, one that has not been seen with any brighness of a star that it should be already known to us. It would be astute to ask whether the observation of thus "up and down" aspect of our journey around the Milky Way has just been discovered. If not, astronomers have long suspected our elongated elliptical orbit around a black hole and could not tell us. It is more likely, however, that our recent turn around the focus of this orbit has allowed this observation, a surprise to us all. The narrator seemed to speak with greater concern for the possible imminence of astronomical danger than previous presentations of this sort. Previously too, I had observed scientific media speak of things that could support these conclusions. We are told that supernova and hypernova are required to create the heavier elements necessary for life as we know it. Astronomers would delight to find our solar system in a direct relationship with a black hole that would have been created along with our solar system by such an explosion. No doubt, they hold their joy with some measure of graveness, while wanting to tell you that our solar system accreted from the material created by this supernova. 2See article: The Politics of Global Warming. Paragraph preceding note altered for scientific correctness August 31, 2011. 3Discovery Science Channel, April 20, 2010 10:00p.m. - Cheat Sheet: Mysteries of the Universe. Mankind has found a tentative foothold on Earth during a cosmic quiet spell, but how long will it last? Find out what would happen if a black hole, able to devour everything in it's path, sets a collision course with planet Earth. 5See article A Compelling Argument against Darwinism for my view on this matter. December 10, 2009 Added postscript. December 11, 2009 Added illustrations. December 11, 2009 Added to postscript. December 15, 2009 Added astronomy info and NASA video. February 11, 2010 Added paragraph relating near asteroid flyby as possible consequence. March 6, 2010 Added paragraph relating polar shift and shortened day attributed to Chilean earthquake as possible consequence. April 23, 2010 Added paragraph regarding unintended support by scientific media. June 27, 2011 Added new material relating to unintended support by scientific media. August 31, 2011 Added diagram illustrating the type of long elliptical orbit by which our solar system might revolve around a large singularity. Made other alterations for scientific correctness. November 8, 2011 Added today's asteriod flyby to section "Possible aftereffects." February 25, 2012 Added section on possible seismic effects. March 9, 2012 Added footnote documenting details of Science channel program cited under Unintended Support by Scientific Media. March 11, 2013 Added recent asteriod flybys and meteor strike of two months to section "Possible aftereffects." April 24, 2018 1.1GTon flyby of Asteroid 2018 GE3 on April 15, 2018 shows that the singularity is still throwing rocks.